Photo courtesy of Brett Forster. 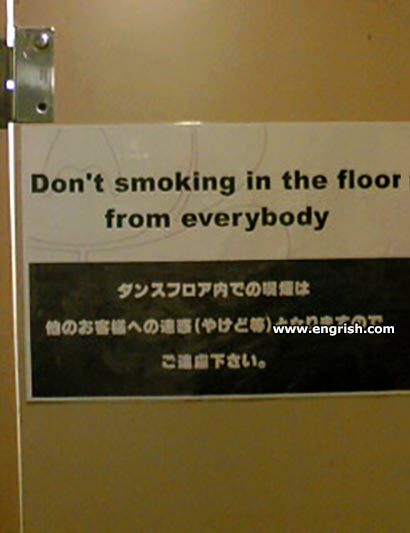 I don’t smoke in the floor unless I’m board. – Are you smoking, Madam? – I see. Get out of the floor, please. At the very least, offenders will get a lot of stairs. Everybody will be on your ash about it. What about smorking on the ceiling? The very first guitar bar chords every teenage guitarist of a certain age played when they learned how to do bar chords…. @Pete 0748. Only if you have the flue. Smoking in the floor can be caused by doing burnouts in your lounge room. @Frank Burns | 5:56 am: Burning Down the House, by Talking Heads. And no dancing during the ceiling. Smoking in the ceiling, anybody?